Have You Downloaded the BERNINA Accessory App? Have you downloaded BERNINA’s new Accessory App? Currently available for Mac iOS 6 and 7 (iPad and iPhone) and Android 4.0 and up, the app will soon be available for Kindle devices in the Amazon app store. Wondering what’s available? There’s a list of BERNINA accessories to browse, most with links to YouTube videos showing the accessory in action. Click to add to your “I Own” or “I Want” lists. Looking for a particular item? There’s a search function for that. Want to see lists of the feet you have and those on your wish list? Click to access that info. But will the accessories fit my machine? Tell the app about your BERNINA machine(s)– models 180 and newer – and it will let you know whether an item is available for that model(s). What else does it do? Check the What’s New link to find out about new accessories, BERNINA webinars, project instructions, and more. 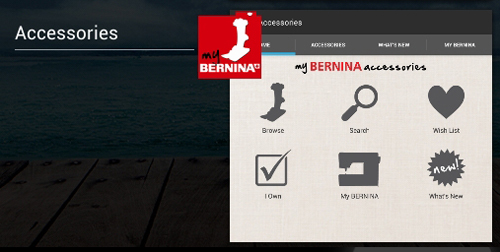 We regret to inform you that the My BERNINA Accessories App was discontinued in December 2014. As such, all future development such as updates, revisions or changes to the app have been placed on indefinite hold. I tried it, but it doesn’t list all machines, it wasn’t that helpful. When I emailed tech support, the machine that the tech suggested I pick instead ALSO wasn’t listed. So it wasn’t helpful at all and I have already deleted it from my phone. I have a new 580 machine . My dealer sold me a foot 39 not the 39C and the app says it’s not for my machine. Although it fits on the machine, am I prevented from using 9mm width stitches because it’s not the 39C. Also on my machine if I check a stitch to see what foot to use, I never see the 39 or 39C as an option. Hi, Trish – Clear Embroidery Foot #39/39C is an alternative to Open Embroidery Foot #20/20C and Embroidery Foot #6. Both 39 and 39C can be used on your machine, but – as you discovered – foot 39 restricts the stitch width to 5.5 mm (the size of the needle opening in the foot), while 39C allows stitches up to 7 mm wide (indicated by the “C”). This is a relatively new foot, and one of my favorites for decorative stitching and applique.